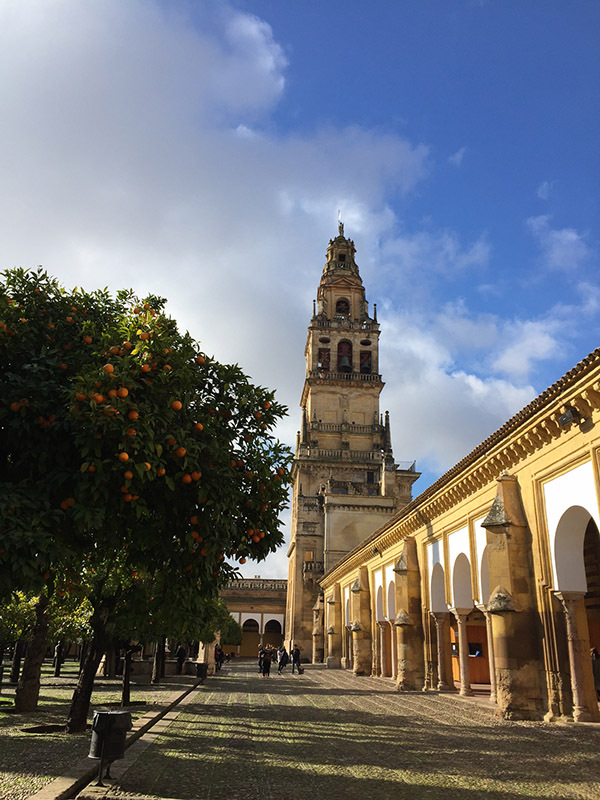 Thursday morning was the time we had allocated to visit La Mezquita, the Cathedral and Mosque for which Córdoba is known (amongst many other historic and beautiful buildings). To our immense relief, the rain had also stopped, and the sun was trying to make an appearance. Mind you, it was still pretty chilly when we ventured out at around 8:45am. Why so early?, you may cry. Well, we knew that, between 8:30 - 9:30/10am, entry into La Mesquite is free, not that the entry charge is even remotely prohibitive (€8 Adult). However, early mornings in Spanish cities are my favourite times. I love seeing the place wake up: people cleaning the pavements outside their bars or shops,; getting deliveries of fresh bread; serving the locals their first cups of strong coffee. Quiet, before the tourists hit their trail. 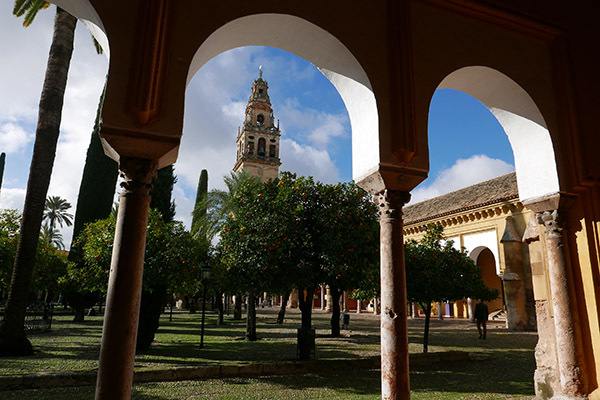 The enormous gates in the walls surrounding La Mezquita were open, providing glimpses into the huge Patio de los Naranjos, or the courtyard of orange trees, a pristine square of cobbled walkways intersected with channels of water and filled with rich green orange trees brightened, at this time of year, with their ripe fruit. In the early morning, this is a tranquil and beautiful oasis that gives very little indication of what is to be found behind one wall. The door to La Mezquita was pointed out to us, half way along one of the patio’s walls, and a friendly usher guided us through a huge wooden door and inside. Andrew and I have seen the photos of the inside of the Mosque-Cathedral, as I am sure countless other people have - the columns and arches stretching in all directions - but nothing prepares you for the scale and atmosphere in this incredible space. 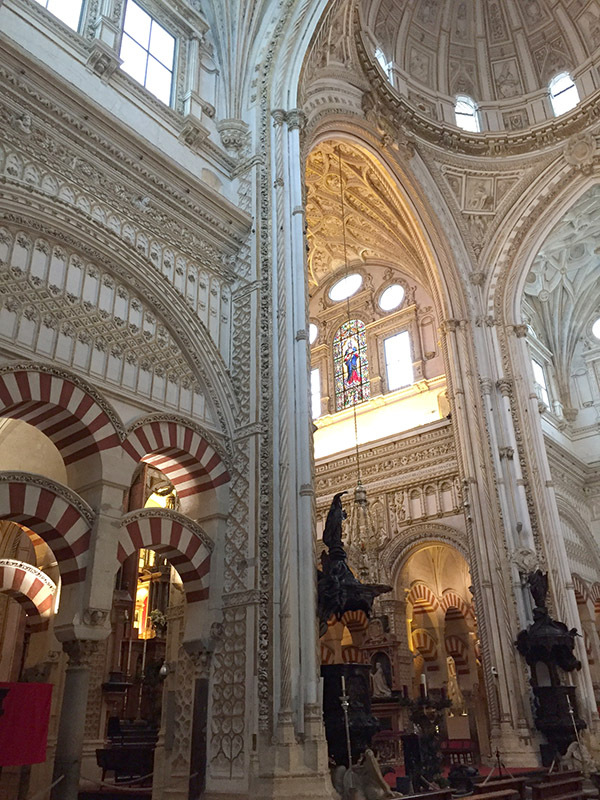 The mosque in Córdoba was first built on the site in 785 AD; the sense of history in these Spanish cities is often mind-blowing. The building that remains to this day is one of the largest mosques in the world (if not the largest, with an area of nearly 24,000 m2), and is considered to be the most important Muslim monument of the western world. Behind the modest exterior wall, this building is like a tardis - it is vast; row upon row of columns supporting delicately carved or decorated arches that, in turn, lead the eye upwards to stunning vaulted or timbered ceilings. No photograph does justice to the scale of this space, yet it still has a very human intimacy - not the soaring heights of the grand gothic cathedrals here. The idea of rows of columns (some 856 of them) does little justice to the surprise with every step that opens up a new view, a different angle or perspective, a subtle change in light and shade. The perimeters are lined with chapels dedicated to countless saints, all richly decorated sanctuaries in their own right. Being early in the day, there were few visitors. Staff busied themselves cleaning for the day ahead, and a crew were setting out chairs and staging for what looked like a sizeable event, to be streamed over large LCD screens that were strategically placed for viewers. This is very much a working place of worship as well as an historic site that draws in well over 1.5 million people each year. Paintings hang everywhere, giving the space another identity as an evocative fine art gallery, and light filters through rooflights, window grilles and doorways creating drama everywhere you look. In one area, a glass floor panel protects a perfectly preserved Roman mosaic floor that lies beneath - a reminder that a Roman chapel sat on this site before the Muslim Emir Abd ar-Rahman I began work on the mosque. Andrew and I wandered, unhurried, around this immense and beautiful place, catching glimpses of new areas that drew us further into the heart of the building. I suddenly noticed new dimensions, and moving around a set of columns saw light emanating from above, and bursts of Renaissance and Baroque embellishments, and there, in the centre of the methodical order of the ancient mosque, puncturing the space, stood the most magnificent church. Totally unexpected, and soaring upwards above the moorish columns - white and gilt carvings, mahogany wooden screens and altarpieces and floods of light. Someone started to play the organ, presumably a rehearsal for whatever event was scheduled to take place the next day. We couldn’t physically enter this magnificent church (ticket-holders can), but we skirted the outer shell, awe-struck by this juxtaposition of different religions and cultures. I don’t mind admitting that the majesty of the space and the sound of the music from within the church triggered some emotion and I shed a tear; it was overwhelming. I am not a religious person by any means, but ecclesiastical architecture definitely floats my boat, in the same way that choral music moves me like no other music can. I marvel at the massive accomplishments of the architects and craftsmen who produced the great gothic cathedrals and chapels, going ever higher and using techniques that give the impression of delicate and slender frameworks allowing light to pour in from every angle. There are very few modern structures that have that same capacity to render the viewer and the user speechless. 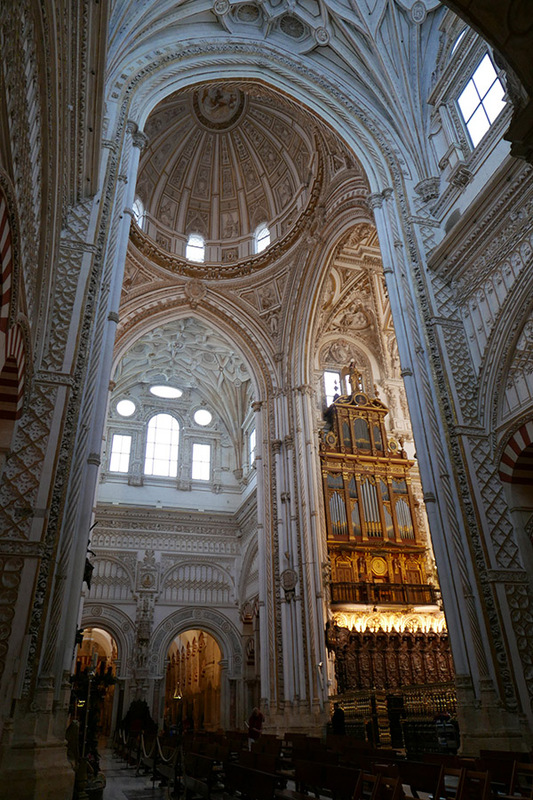 Much has been written about La Mezquita - the Mosque-Cathedral of Córdoba - and many photographs have been taken, and will continue to be taken. When we went outside, I glanced back at this amazing structure and saw, for the first time, the modest Byzantine-style roof that sits over the dome of the cathedral in the centre, again belying the treasures that lay beneath. When any building is described as being a must-see, the visitor can sometimes be disappointed. 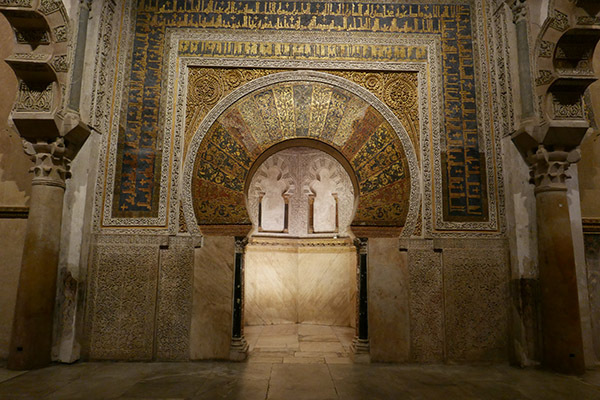 I can safely say that nothing prepared me for my personal experience of visiting La Mezquita.